Downey Daily Photos: Caught in the act! We often have squirrels in our yard. They are a common sight in Downey. 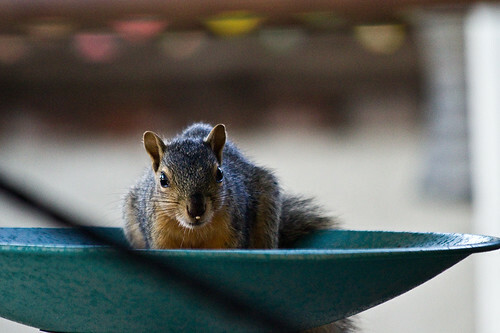 We even have a feeder for the squirrels. It is filled with unsalted, unshelled peanuts. Evidently we ran out and this squirrel was not okay with that. Here he is in a bird feeder, eating the bird seed. If you look closely, or enlarge, you can see a seed stuck on his nose!